On Monday 6 January, Cairo’s Falaki theatre filled with a large number of Egypt’s cultural players, people involved in arts management in a variety of institutions across the country. They were there to attend a symposium given by Brett Egan, director of the DeVos Institute of Arts Management at the John F. Kennedy Center for the Performing Arts in Washington, DC. The event was organised in collaboration with the US Embassy in Cairo and the Arts Enterprise Network of Egypt. It was not the first visit to Egypt by Kennedy Center specialists. One of the earliest symposiums dedicated to arts management was held back in 2007, when Michael Kaiser, the president of the Kennedy Center, held a two-day Arab Arts Symposium at the Arab League headquarters in Cairo. The main aim of the 2007 event however was to boost US-Arab relations in preparation for ‘Arabesque: Arts of the Arab World,’ the 2009 three-week-long festival that brought 800 performers from over 20 Arab countries to Washington. 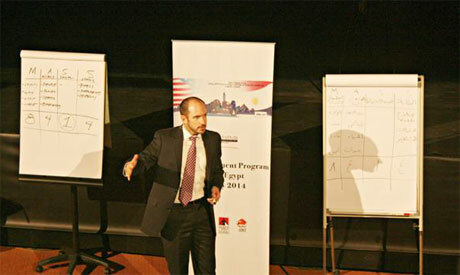 In 2007, Kaiser spoke about arts management from the perspective of his experiences in the United States, showing how it might be practised in many parts of the Arab world. Al Mawred Al Thaqafy, already an important cultural institution in Egypt, documented the many benefits of the symposium. But at this point, Egypt still had a limited number of organisations and cultural initiatives that could navigate the cultural market with a business understanding of the arts. A lot has changed since then. Today, and especially following January 2011, arts management has become necessary as a tool for the survival of cultural players. No doubt, Brett Egan’s symposium came had perfect timing. Over the past few years, a lot of cultural institutions entered the market, competing for their presence, support and visibility. While independent cultural players have definitely benefited from Egan’s expertise provided by, much of which they can put into immediate practice, the institutions operating under the Ministry of Culture have had the chance to revise their principles and — sigh! In a few hours’ time, Egan pointed out some basic principles he believes to be at the core of the success of any cultural institution. He underlined, for instance, the crucial role of a proper mission statement, a contract between the institution and its audience. Egan explained that mission statement, being the main operational tool, must answer three basic questions: who are we serving, what are we serving those people with, and where do we want to have the biggest impact. A short look at Egypt’s cultural institutions reveals that only a few of them, and apparently those that prove successful, have a clear mission statement on their website. Egan went on to elaborate on the importance of forming a “family” within the cultural institution. By family he meant a limited network of people directly involved in the work of the institution and its supporters. Family members, lifeline of the institution, are in four categories: those who believe in the mission and as such are dedicated to the institution as it is, those who believe in access to something interesting that no other institution can provide (eg, a sneak peak at the backstage of an artistic production, meeting with an artist), those who believe in the importance of social life with the institution (eg, people who like to be involved in social events) and those who see prestige in the sheer fact of being involved in the chosen cultural institution’s activities (represented often by people in power, corporate organisation, etc). The four parameters are as key to managing the functioning and policy of the institution, enacted through the board of directors, as to its sustainability and visibility. At first sight those basic pillars of any successful cultural institution seem simple and clear but the real challenge is in their long-term implementation. Egan also tackled issues related to the marketing of the cultural institution, dividing it into pragmatic and institutionalised categories. He repeatedly stressed the need for a variety of marketing efforts to be implemented for different activities. For instance, marketing a concert by a world renowned singer will differ from promoting a new talented artist unknown to the wide audience. This aspect is one of the crucial challenges, probably insufficiently recognised by too many cultural organisations operating in Egypt. Whether it is El Sawy Culturewheel, the International Music Centre or the Cairo Opera House, an independent institution or one operating under the Ministry of Culture, all show a certain amount of marketing equally distributed among the activities held on their premises: informational campaigns. But mission is as important as information at the pragmatic marketing level for performers who for various reasons are not well recognised to the large segment of audiences. For artists, the cultural market is not an easy place. For the time being, mission campaigns practically do not exist in Egypt; when they do, they are usually based on desperate attempts by the artists themselves to promote their work, introducing audiences to new concepts and values. With no financial support for such campaigns, the social media — and Facebook in particular — have become the window for most such efforts. There should be no need to go into a discussion of marketing issues in Egypt’s cultural institutions. By pointing out certain facts, Egan will hopefully have made those present realise that it is about time to look at their art management practices from a different angle. I managed to have a short conversation with Egan in which I tried to narrow his theory to the music field and talk about audience development. Egan pointed out the importance of being aware of the needs of the audience. Creating trust with the people by listening to their expectations and by studying the environment, music institutions will be able to address the right people with well tailored artistic propositions. This does not mean that the public should directly dictate the event’s content. The audience’s interest or lack thereof is often determined by their awareness of a specific art form. This is where knowledgeable managers in the marketing department should recognise the area that needs attention and adopt a suitable mission-oriented methodology — back to square one. Egan stressed the fact that all around the world there is a great challenge in reaching audiences particularly with the classical arts. Again he expressed the need for investing time and thought in overcoming such challenges. “Education of the audience is a long-term answer,” Egan said, adding that one cannot depend on the same tools that were used 10, 30 or 100 years ago, since audience expectations have changed dramatically over time. As an example of this change he discussed how a century ago, audiences were able to give their full attention to one specific activity. “Today, a young person does 10, if not more, activities in parallel, juggling between television, Internet, social media etc. It is a great challenge to make a person focussed on one event for one whole hour. This is the main challenge with the new generation,” Egan explained. While young audiences might expect different performance rituals such as an unconventional place to listen to classical music, it is in the hands of the managers to respond to those needs. Egan believes that traditional performance concepts and spaces should not be changed, but he feels it is necessary for every orchestra, dance troupe, opera singer, to work on the second track in parallel. The world of the performing arts has already begun implementing the many ideas that Egan provided. For instance, in the late 2000s, the renowned UK Orchestra of the Age of Enlightenment launched The Night Shift, a concert series attracting a new and growing audience. Organised in parallel to their regular concerts of classical music, The Night Shifts begin later in the evening, around 9pm and include guest artists and DJs after the concert. With artistic institutions around the world facing growing competition and a tighter budget, the cultural players will have to look into and implement concrete tools to assure the survival of their entities.